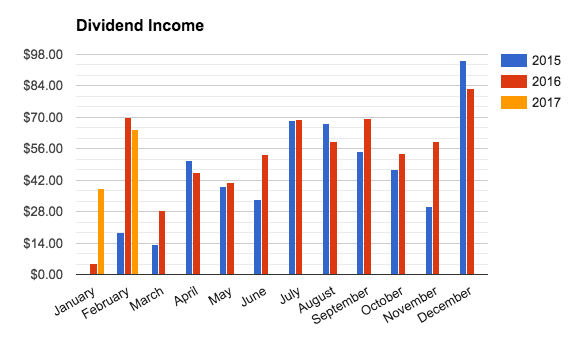 I have collected $64.41 in dividend income so far this year! This month I received income from FOUR different sources. This is fewer than January but I am not discouraged because I see great the great strides I have made in my investing journey. 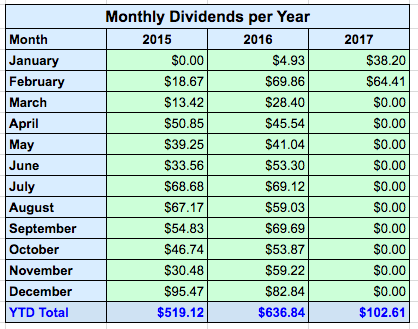 Compared to to 2016 my dividends in February decreased by 7.8%. This is due to the volatility in the BX dividend paid - so will be staying away from this one for a little while. In fact, I would actually like to close this position at some point so that I can stop having to file K-1s for it (previously I did not take into account the additional tax work necessary from this small investment). STILL just like every month - my portfolio is definitely not yet where I want it to be, but I continue to follow the right track as you can see from my February purchases. 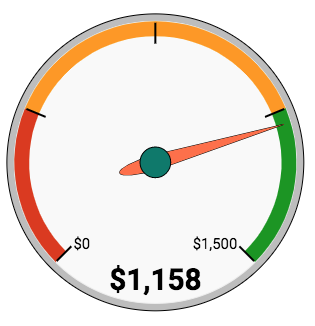 I am happy however to announce that Fundrise has started an automatic dividend reinvestment program. SO, I will test this out and see what it leads to. Nice results from just a handful of companies. I hear you about those K-1s. Way back when I held pipeline stocks like EPD, ETP and more it was annoying getting them in the mail after I already filed taxes as they were always mailed out later in the year. Keep building that passive income stream. Still a nice showing for Feb even though it was basically flat year over year. Nice work, looks like you will have a solid year this year.